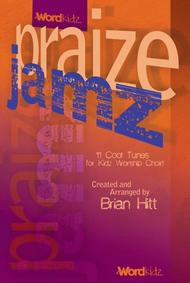 Praize Jamz (11 Cool Tunes for Kidz Worship Choir!). Composed by Brian Hitt. For unison/2-part children's choir, piano accompaniment. Collection. WordKidz. Praise & worship. Choral score. Published by Word Music (WD.080689499173).Relevant songs, innovative sounds, and a signature style are just some of the reasons your Kidz Worship Choir will love this new project from WORDKIDZ and creator Brian Hitt. Singable, accessible, fun, and full of great ministry opportunities, Praize Jamz is a cutting-edge worship project for children's choir guaranteed to revolutionize and raise your expectations for your children's music ministry.Praize Jamz takes your kids' choir experience and turns it up a notch! While perfect for any children's choir ministry and performance opportunity, it can also be used as a soundtrack for worship in children's church, camps, or any time and place kids gather to worship their God and Savior. Use Praize Jamz as the ideal resource to help train the next generation of worship leaders and instill in them a love and passion to lead others into the presence of the Lord through song, as they lift their hearts and voices in worship. Turn things up yet another notch with the use of the high-wattage, visually-explosive DVD Accompaniment Track. Praize Jamz... a new experience and fresh sound for Kidz Worship Choirs everywhere!